No one ever wants to deal with a sewage backup in their home. No one ever wants to deal with a sewage backup in their home. 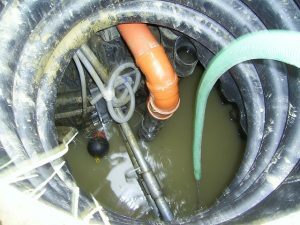 The backup happens when something is blocking some part of your home’s sewer line. The result is a messy, stinky headache that requires a massive clean-up effort. If you want to prevent a sewage backup in your home, follow these tips! Grease– When you’re done cooking, you might think that the liquid grease will just run down the drain like any other liquid you pour in. Unfortunately, this could not be further from the truth. That grease is only liquid until it cools. Once the grease cools and hardens, it becomes solid. If that builds up in your pipes, it’s “game over”. Solids– The only “solids” that should be in your home’s plumbing system are humans’ solid waste and toilet tissue. Diapers, hygiene products, and anything else that doesn’t dissolve in water should be disposed of in a trash receptacle. Wipes– We are well aware that there are many different brands of “flushable” wipes on the market. Unfortunately, these products can still get caught in your plumbing system and cause major problems. Hair– Hair is one of the leading causes of blocked pipes. The longer the hair is, the bigger the risk of a backup. Consider using a drain-guarding product on your tub and/or shower. There are a bunch of things out there that let the water drain just fine, but block anything else that might be trying to sneak in. Trees– No, we aren’t suggesting that you’re flushing a tree down the toilet or anything like that. Actually, something many homeowners don’t know is that the trees on their property can interfere with the home’s plumbing. What can happen is that if a tree is growing too close to plumbing lines, instead of growing around the underground pipes it can actually push through. This causes all sorts of problems. Call Master Plumbing today for a professional video inspection of your plumbing to make sure no tree roots are in there! This entry was posted on Friday, September 14th, 2018 at 8:59 pm. Both comments and pings are currently closed.